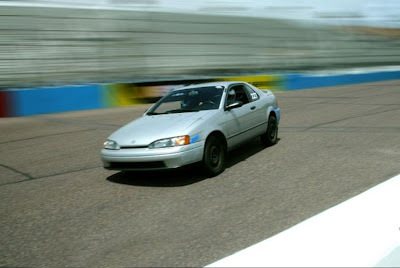 OHL fans, we want to get your suggestions for improving this car for track duty. What better place than One Hot Lap to really find out what this poor little Toyota Paseo needs! Sway bars. Definitely sway bars. Sell it and get a used prepped Miata! LOL, Krys! Nice and light chassis. All it needs is a big motor, fat slicks, suspension, and brakes, no? The car needs more cowbell! That's it! Axis of Oversteer (great site to check out!) is suggesting Fire. I think it may take Earth, Wind & Fire!